Your Community and Take Work off Your Staff…all at no charge! But how can you with limited staff and budget? Jesus rarely told people who He was before He healed, fed or did some other miracle to show God’s compassion and love for them. If the calling card of the author of the gospel Himself was service, and we know we can’t out-preach Jesus, then we must follow His model. He even sent the disciples out with the message to not just preach but to heal and meet needs. In fact, the church WAS the food bank and homeless shelter for 1900 years. However, the church’s role in service to families in need has diminished dramatically in recent years. Meanwhile, it’s no coincidence that cynicism about the Church and Christians continues to grow. More and more people believe the church is about inflow, not outflow. But how can churches do more than occasional events today? They can’t possibly identify and communicate (to members) the vast array of needs of local charities, families, and events. In this modern age where social networking and online shopping connect so efficiently, local needs are still communicated via the pulpit, bulletin, phone calls, and emails. Through Meet The Need your members will be able to see and search on your web site for live opportunities to serve. Imagine providing a "window" to the outside world, showing members live opportunities to volunteer at local charities, help local families, or give toys to a local drive. On top of that, what if you were given all the tools you need to run your own events, manage all of your benevolence efforts and missions trips – even handle all of your internal volunteer needs for greeters and ushers? 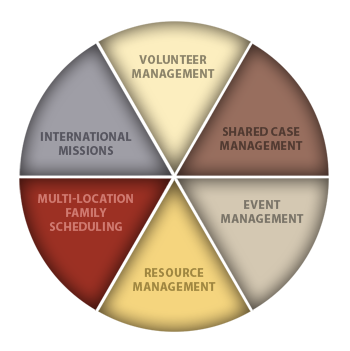 With Meet The Need, your church will be in complete control of volunteer and needs management. You will dictate what needs show up on your web site and how they appear. Then, you’ll see where every member and team within your church has served, even if they signed up on a local charity’s web site. Meet The Need looks exactly like your web site so your members and the community won't see Meet The Need’s heart for serving others - they'll see yours. …and despite the 10 years and millions of dollars investing in building all this, Meet The Need is a donation-funded 501c3 so there are no required fees for using Meet The Need. • Volunteer Mobilization Let members "shop" on your web site or social media pages for opportunities to serve inside or outside the church. Even set up teams for each ministry group within your church, whether it’s greeters and ushers or a community action team. • Event Management Quickly and easily set up, take sign-ups, send reminders, and track attendees for any kind of event. As a collaborative platform, Meet The Need is also ideal for events you’re doing with other local churches and charities. • Benevolence When families walk into your church, see where else they have been and what assistance they’ve received from other organizations using Meet The Need. Track and record assistance you provided to all families and anonymously communicate their needs to your members. • International Missions Broadcast needs of your missionaries heading into the field or your upcoming missions trips, anywhere in the world. How else could you easily show your members how they can support your mission efforts, whether it’s providing resources or even going on a trip themselves? While Meet the Need works with many of the largest churches in the country, it also enables a relatively small church to have a tremendous impact in its city. "Our genuine desire is to serve the people that no one else wants to serve," shared Octoryia Robinson of Shiloh Restoration Tabernacle. Shiloh has a relatively small paid team and congregation, but is extraordinarily outward focused and has local mission tools that normally only a larger church could afford. Their involvement in the community goes far beyond emergency assistance and Holiday help. The community knows Shiloh cares…year round! • Targeted outreach events multiple times throughout the year such as back to school supplies and Rock the Park that draw between 250-1,000 people each. • Not just giving hand outs, but providing intensive discipleship, accountability and coaching for individuals serious about life-change. Shiloh leads families toward self-sufficiency. "Meet The Need Has Energized Our Church" Senior Pastor, O’Neil Salmon feels strongly about leading a church that models what it teaches and preaches. Momentum is always initiated when positive and negative energy meet. Creating a positive outlook on evangelism or outreach is vital in a world that’s filled with negative messages, influences and dogmas. But Pastor Salmon believe a memorable, motivational message must be backed up with decisive action. Two years ago, Shiloh got connected with Meet The Need. "Meet The Need has energized our church to connect with the community even more—and on a consistent basis. There is a new energy within our ministry. We can easily keep people informed and motivated," said Octoryia. "Beyond getting our members better connected, Meet The Need has allowed us to be good stewards of who God has entrusted us to serve. We are aware of what other ministries in our city are doing. We are able to stretch our resources. We have seen our resources go further. For us that means a lot – sometimes your ‘good’ can be ‘no good’ if you are not reaching the people who really need to be served." "We loved our Excel spreadsheets, but Meet The Need is so much better. It makes follow up so much easier. We can schedule families for future visits and appointments. We can report quickly. Actually, we have a much better understanding of who we are serving than we ever did before. This has really helped us be more focused in our outreach. Meet The Need saves so much time—and is so easy for our core volunteer team to use. We have a small staff team, and using volunteers for our events and classes is so important." "We search the database for families all of the time. That is our first step before we schedule a family to receive help of any kind. We want to offer whatever help is best for them. And, if another ministry has already met a need or if there is a need posted, we’ll try to do something else." How can Meet The Need be donation-based? Meet The Need’s mission is to see churches and charities bringing more help and hope to those in need. Our vision is about collaboration, so to ensure everyone says "yes", we provide tremendously valuable applications and then don’t charge for any of it. We request only that organizations consider donating to help cover the costs of providing Meet The Need to them and others around the world. Do we need to be tech savvy to use Meet The Need? Not at all! There are no disks to load and very little training required. The set-up of Meet The Need is almost entirely done by Meet The Need and involves no IT work on your part because Meet The Need hosts the technology. Meet The Need operates within a church’s or charity’s web site via links that are simply attached to buttons and display the needs that the organization wants to show to its members. Can we control the needs that are shown? Absolutely. You select the local charities your church partners with - there’s no way for the needs of charities that you "hide" to show up on your web site. You’ll also use Meet The Need to create buttons showing your needs for internal ministries, events, families or international missionaries and mission trips. Why do you make all of this look like our web site? You’re Christ’s "storefront" to your community – the face of God’s love. It’s your church’s heart for the hurting that needs to be seen, not Meet The Need’s. So we’re quite content to stay "behind the scenes". We don’t recommend putting Meet The Need’s name or logo anywhere on your web site or social media pages. This page loaded in 0.00441 seconds.